Every year, throngs of people—maybe even you—choose a list of resolutions for the next year. Generally, these are habits they will try to do every day, or habits they will try to avoid for as long as they can. Unfortunately, many of these resolutions are forgotten by March. A major reason for this is that it’s deceptively difficult to develop or deny ingrained habits ‘cold turkey’. Resolutions stay the same: “I will go to bed by 10pm.” “I will stop eating junk.” “I will go to the gym five times a week.” If these are somewhat big changes, it may feel like a huge change with no buildup. Goals, however, can be tackled in steps, beginning with baby steps and increasing in difficulty as you become more accustomed to the change. This makes goals more realistic for lasting change. Goals give you a direction to aspire to, but with the baby steps you may be taking toward your goal, you can still feel like you’ve accomplished something and are on the right track, which will, in turn, keep you moving in the right direction. Once you’ve broken a rigid resolution, however, it’s easier to feel like a failure and give up. Resolutions are usually a means to a goal, but if you find a resolution too difficult to stick to, it’s usually dropped and forgotten. With goals, if you find a planned change too difficult to carry out, you can drop that plan, but pick a different new behavior to try that will still lead to the same end result, and not lose sight of the goal. For example, imagine you want to get in the habit of exercising to be in better shape. You might make a resolution to go to the gym five times a week. But if you find that you just hate the gym, you probably won’t stick to your resolution, and you’ll be no closer to your goal. However, if you make ‘getting more exercise’ the goal, you may drop the gym, but switch to walking through your neighborhood each morning, and still meet your goal. Keep your future in mind. Think of what you would have in your ideal life, and where you’d like to be in two, five, or even ten years, and see if your goals bring you closer to that picture. If so, they’re good goals to stick with. If you can keep in your mind the image of where you would ultimately like your goals to take you, it’s easier to stick with them. Think in terms of broad changes rather than specific behaviors. For instance, resolving to “Develop A Stress Management Practice” gives more room for growth and change than “Do Yoga Every Morning”. While you’ll want to put your broad goals into specific behaviors, deciding to Develop a Stress Management Practice gives you room to experiment, and allows you to change course if you find that Yoga isn’t working for you. Think in terms of what you’d like to add to your life, rather than what you’d like to take away. For example, instead of making the goal to “Eat Less Unhealthy Food”, focus on trying to “Eat More Healthy Food”. You may subconsciously feel more deprived if you think of taking something awayrather than adding something good, and if you replace unhealthy food in your diet with healthy food, the same goal is accomplished. Also, it’s usually easier to add a behavior than to stop a behavior. 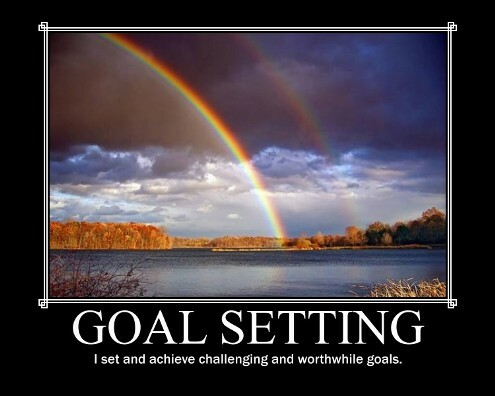 Once you have your goals set, keep them in the forefront of your mind. Keep them listed in your day-planner, have them as part of your screen saver, or post-it them in prominent places around your house for a while. Reward yourself with something small for continuing to stick with it, until you make enough progress toward your goals that the progress becomes its own reward. And remember that change doesn’t come overnight, but as you work toward developing what is important to you, the change will come, and it will be lasting. Remember this, and enjoy building the life you were meant to live!